Exposure to harmful algal bloom toxins found in cyanobacteria (blue green algae) or Kareia brevis red tide can cause severe illness in pets, livestock, and wildlife when contaminated water is ingested or when animals lick their fur after swimming. Animals that swim in water with algae blooms may experience illness depending on the amount of toxin they are exposed to. Symptoms include increased drooling, loss of appetite, skin rashes, trouble walking, weakness, vomiting, diarrhea, numbness/tingling, difficulty breathing, heart and circulatory problems, convulsions, loss of consciousness, and death. This may happen with little time for owners to respond. If your animal shows any of these signs after contacting a bloom, please see your veterianarian. Harmful algal bloom poisonings can occur when animals drink water containing algal toxins, when they clean or lick their fur after swimming, or when they consume algal mats. 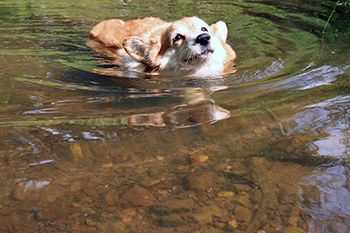 Pets that swim in water with an algae bloom should be immediately washed before they have a chance to lick their fur. Because of their relatively smaller size and body weight, some animals can suffer greater adverse health effects after ingesting, inhaling, or having dermal contact with algal toxins. It is good practice to keep pets and other domestc animals out of the water during and after a bloom. There is no way to know if a bloom is toxic without testing a sample in a laboratory or using a field test kit. Pets, domestic livestock, and wildlife should not swim in or drink water where an algal bloom, discolored water, or foam is present. Remember, algal blooms can present in shades of bright green, brown, red, orange, purple, and yellow or other colors. Sometimes algal blooms are reported to resemble spilled paint in the water due to their bright colors. Pet owners should report any severe illness to their veterinarian immediately. Pets that have been exposed to a bloom should be washed with clean water quickly before they have a chance to lick their fur.